What a wonderful day it was yesterday to see the mass enthusiasm for the new President. As a still relatively new immigrant to these shores I have been drawn into the whole process since the beginning of the primaries and thoroughly enjoyed it all. I am one of those people who enjoy watching politics in action and this cycle has been well worth watching. I know that as time goes on I am feeling more attached to my new country but for me it has been a very slow process. Not because of the people I know and love here, not because of my friends and the people I meet day to day. But because of the leadership and direction it has taken us in. To my British view it has not looked or felt good. With the promise of this change however, whichever way it had gone but especially as it has turned out, I have felt a growing attachment and of pride in what has gone on here. Until yesterday I had only lived here under President Bush. I am very much looking forward to at least the hope of seeing America become again what it should be. I think it will under President Obama. As mentioned in the last post I have just started to build a brace of Pond Sprites. These are serving a dual purpose in checking my latest laser cut parts plus providing two boats to take to the Footy National Regatta in Orlando in March. The prototype Pond Sprite came second in last year’s Sheboygan Footy Fest against some very stiff competition. Since then the design has gone through some changes on deck to give easier access to the internals with a single bigger hatch. The sides and bottom are now ply rather than balsa which is so much easier to finish smoothly and tougher too to resist the occasional bump. This is a medium width boat, 105mm (4 1/8″) at the waterline with a low rocker and blunt rounded bow. She handles very nicely, beats hands off and is very good down wind. In changing to ply sides and bottom the weight will increase a little which will suggest the use of the lighter Lithium Energiser AA batteries to lower the battery weight. This new version of the boat is taking into account the change in the battery rules (for racing footys) which will allow any size or type of battery to be used. Once the rule is in effect I will most likely change to 3x AA Lithium Energiser or 4x AAA batteries of any type. I will do the same in my Kittiwake K2 also. In the photo above I have just added the decks which are taped down while the glue dries. Next I will be fitting the rudder mount and fitting the keel fin. Then will come the finish, I am pondering how to do these two boats. I like varnished wood and usually varnish the deck and paint the hulls. I have found that all varnished wood can be difficult to see at distant turns when I am racing. However, I am thinking that a varnished hull with painted deck will make a change and will be easily visible. I also might do something outrageous and artistic… we’ll see. The building season is well under way here in the chilly northern parts of the USA. Snow has been on the ground for weeks here in south east Wisconsin and the lakes and ponds have been frozen since mid November. It would be easy to get frustrated especially as I read about the footy activity going on right now in Florida. But that would get us no where so I’ll enjoy the evenings in the workshop knowing that the grass doesn’t need cutting or the vegetables watering… it’s just that the snow needs moving… argh. So I am planning ahead and in a day or two will be starting to build two Pond Sprites to prove the laser cut sets and photograph for the kit CD. One of these boats will be my boat for the Footy National Class Races in Orlando in March. Those of you who like a wooden removeable hatch rather than the taped down plastic type hatch will like the Pond Sprite. 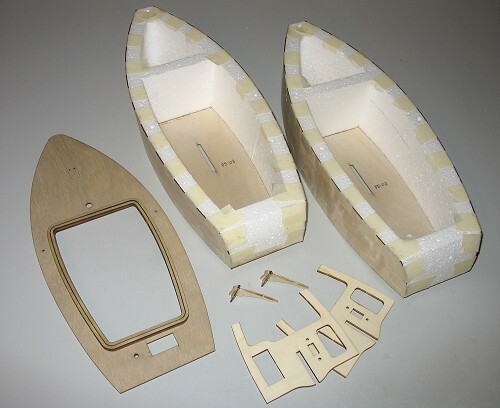 The boat will be testing a type of laser cut frame which will make into a simple and snug fitting hatch. The Pond Sprite is narrower in beam than the Kittiwake K2, around 100mm or 4″. The hull form has less severe curves than the K2 and less rocker. With it’s signature curved plywood transom it is a pleasing shape but distinctly different to the K2. In fact that’s the original prototype in this blog heading photo. The rig will be of a two sail sloop design with a large jib which gives it good balance downwind. The Pond Sprite took second place in the Sheboygan Footy Fest ’08 against pretty stiff competition. I think on that day in a good wind it’s great strength was down wind performance, it romped away from the field at times. When will the kit be ready?… well if things turn out as planned I am aiming for mid March after the NCR event in Orlando. This is already a well tested boat with a number of rigs already sailed in varying conditions. 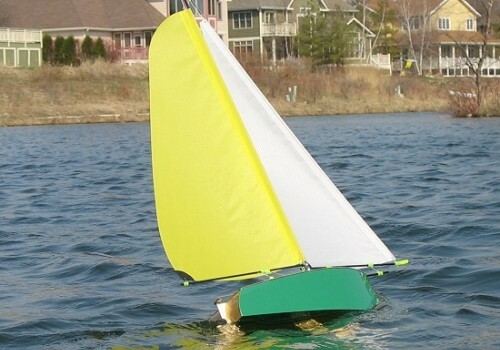 One of my club mates commented when he first sailed Pond Sprite that it handled like a bigger yacht, meaning that it tracked well on a course and was easy to sail. I know I like it and I hope that you will too. Watch this space, as they say.